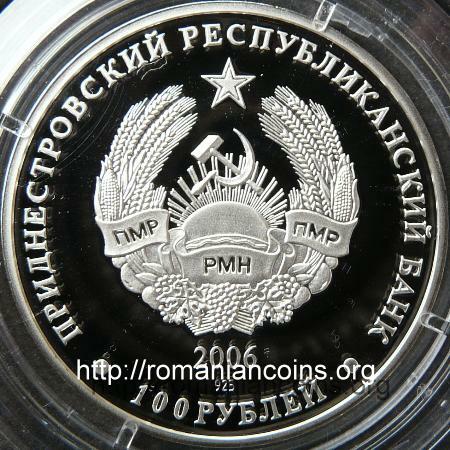 This coin belongs to the "Old Fortresses on River Nistru" series, that comprises several 100 rubles silver coin, with Tiraspol Fortress (2006), Tighina Fortress (Bender, 2006), Kamenets-Podolsk Fortress (2007), Soroca Fortress (2007) and Cetatea Albă (White Fortress, 2008). 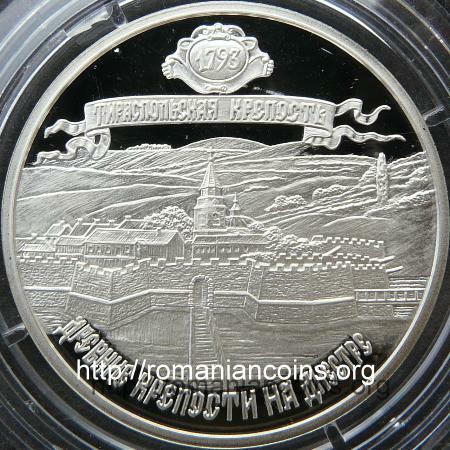 In 2002 the Transnistrians issued another silver 100 roubles coin featuring the Tiraspol fortress. On the coin appears the year 1792, when the city was founded, so the coin celebrates 210 years from the establishing of the city of Tiraspol, under marshall Suvorov, also represented on the coin in a medallion. The silver coin pictures above are present on Romanian coins through the kind permission of Mr. Aureliu Ciobanu, collector and dealer of coins and stamps. The Russian Empire did not reach the river Nistru until 1792, the year in which the entire Transnistria entered under Russian administration. The territorial extention to the line of Nistru was achieved under the command of marshal Suvorov that succeded in pushing back the Ottoman Empire yet farther. The town of Tiraspol was settled in the very year of the frontier movement on River Nistru - 1792 - over an old village named Sucleia Veche and inhabited by Moldavian fishermen, next to the fortress of Tighina, fortified by the Turks and an important center of military pressure since the first half of the 16th century when Moldavia lost it in the times of prince Petru Rareş. Initially there was nothing more than a wooden fort bearing the name of Sredneaia - Midway - but shortly after it received the name of Tiraspol by the ukase of czarine Catherine II. As they advanced west and south, the Russians stumbled upon the vestiges of ancient Greek civilization, that cast in turn a special fascination over the new masters. So justifies the name of Tiraspol for an entirely new settlement after the ancient Greek name of river Nistru and of the town of Cetatea Albă (Tyras) at the mouth of the river at the Black Sea. Similarly has Odessa received its name (founded in 1794, over the settlement of Hajji-bey), from the ancient Greek city of Odessus (today Varna in Bulgaria), Ovidiopol (founded in 1792, over the settlement of Khaji-dereh), after the Roman poet exiled at Tomis. Other toponyms created in the same period were Kherson (1788), Eupatoria, Leukopol, Sevastopol, Simferopol, Phanagoria, Theodosia (old Genoese city of Caffa), Olbiopol (1781) from the city of Olbia at the mouth of river Bug. The city of Tiraspol was part of the New Russia gubernia (Novorosia - 1795), than of Nikolaev gubernia (1802) and Kherson (1806).